It's a nightmare scenario for any cyclist: casually making your way down the road when you look up to find a car bearing down on you. With no time to react, there is nothing that can be done but brace for an inevitably painful impact. It was just this nightmare that was realised by cyclist Patrick Knetemann as he pedaled his way through Slough in Berkshire late last month. Captured on his handlebar-mounted camera, the 34-year-old office worker suddenly finds himself confronted by a black VW Golf that has blindly turned into his path. The wince-inducing collision is enough to send Knetemann bouncing off the windscreen and clean into the air, after which he lands in the gutter with a sickening thump. The callous VW driver then drives off, leaving Knetemann with cervical disc fractures and extensive bruising. Thankfully an off-duty Paramedic was passing by and came to his aid. "He came out of nowhere," Knetemann told the Mirror. "The impact was so quick I had no time to stop. 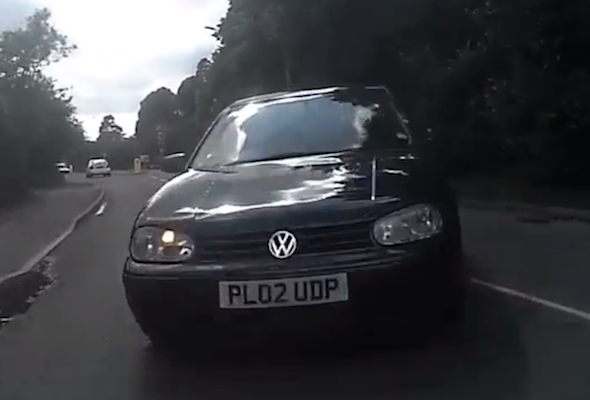 I hit the windscreen with my shoulder and it shattered straight away - that shows how fast and hard he hit me. "But I had a light on my bike, and I was wearing a bright red helmet. After one or two seconds he sped off leaving my there on the pavement." Police are now investigating the incident and attempting to trace the hit-and-run driver. Click play below to watch the collision as it occurred.